doPDF is a free and lightweight application that enables you to easily create PDF documents. The program also allows you to convert any kind of printable document to PDF. This methods works exactly as you would use a regular printer, but the result will be a PDF document stored on your hard drive, not a document printed on paper. Creating files via the doPDF Startup window. The application has an executable file which will start a conversion wizard when you run it. It's lightweight, free and easy-to-use. 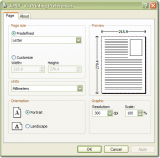 Allows you to create PDF files by using two methods. doPDF has been tested by Download82.com team against viruses, spyware, adware, trojan, backdoors and was found to be 100% clean. Our editors will recheck this software periodically to assure that it remains clean.